Decorate eggs for Easter with this colourful kit. 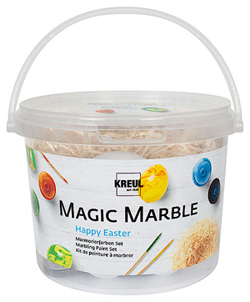 Contains 4 x 20 ml Magic Marble Marbling Paints in Citron, Orange, Light Blue and Light Green, along with 5 plastic eggs, 5 marbling sticks and wood shavings for decoration. Instructions are also included with clear step-by-step photos. The paints are suitable for wood, glass, plastic, paper, metal, terracotta, polystyrene, candles and more. Not permanent on fabric. Add drops to a water bath and create patterns, slowly immerse the item then remove for Magic results!